When the Fed pivoted its easy money policy on January 4th earlier this year, the extremely oversold market responded with vengeance! The market participants have since pushed the market over the limit by triggering the fear of mission out motions. The selloff occurred during the first week of March was promptly bought back up last week despite a series of weak macro economic data. As a matter of fact, the market is cheering for weak economic data to keep the Fed from raising rates. The same old game is back on all over again, using cheap money to push up asset prices. As long as the asset price is steady and up, everything is fine. Is really everything fine? Can they keep the game going forever? The most powerful secret weapon for the stock market rally has been the extreme accommodating easy money policy, that directly inspired the American corporate financial ingenuity to work its magic. The corporations borrowed cheap money to buyback their stocks to improve the earnings per share (EPS) and return on equity (ROE) financial metrics even if the revenue is the same. It’s fine if the corporations only used cash on balance sheet, but many borrowed money to buyback stocks to fuel the rally. By the time we reach 2021, we will have over $2 trillion in investment grade corporate debt maturing. This is going to present some very interesting problems. The bulk of corporations, funded themselves with short-term debt. With about $2 trillion maturing by 2021, they will end up pushing interest rates higher from there onward, that will be the end game for the everlasting bull market. 2021 seems to be far in the distance, our present pressing issue is to take advantage of the new 4-year cycle that began in December 2018. As we blogged before, we are expecting the bull market to last at least until the re-election time, that is November 2020. Every dip can be bought until November 2020! The trade war resolution has been rumored to be sometime in April, if so, that would further elongate/stretch the current weekly cycle that started in the first week of January 2019. Anyone with some sanity would NOT short the market before the trade war resolution announcement. It’s just too dangerous to get caught in the bear trap. Technically, it is 5th day into the 3rd daily cycle in the weekly beta cycle. 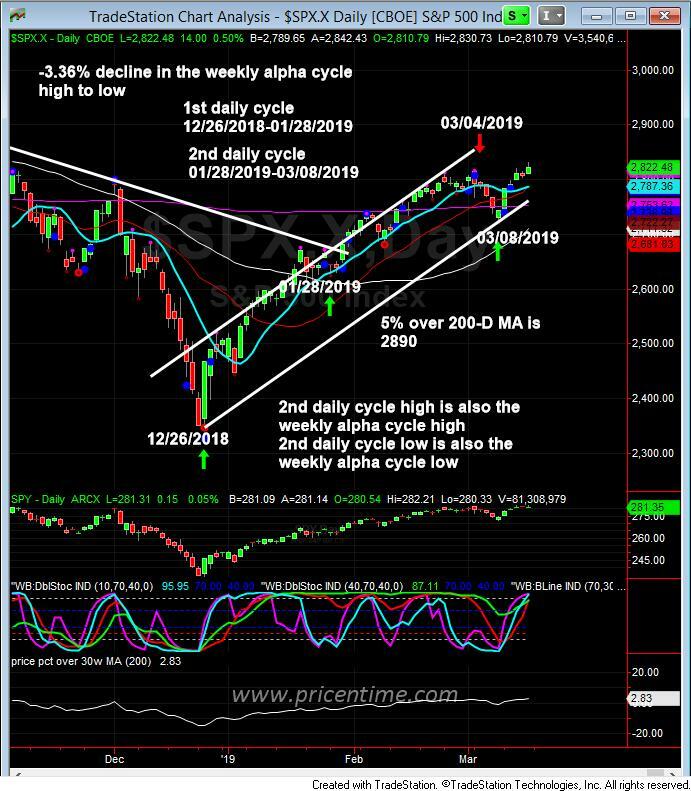 The 3rd daily cycle should continue to display as a bullish cycle with right translation, which means the top of the 3rd daily cycle will occur on the 8-15th bar. So we should expect next 1-2 weeks to grand slowly higher. The crash of Boeing stock couldn’t even reverse the bullish cycle momentum, as though it did put a lid on the DOW. Based on the past cycle statistics, it is not unreasonable to expect the current weekly cycle final high to be about 5% over the 200-D MA, which will be 2890 with today’s 200-D MA at 2753. Be patient, the market will exhaust every bear before it takes a sudden quick correction. It will come, be ready to catch the 10% decline! This entry was posted	on Sunday, March 17th, 2019 at 8:20 pm	and is filed under Forecasts, Stock Indices, Uncategorized. You can follow any responses to this entry through the RSS 2.0 feed. Both comments and pings are currently closed.